Bromeliads come in hundreds of species and varieties, from tiny to very large, and are a colorful addition to a tropical garden or an interior decor. Bromeliads spread by putting out multiple pups from a mother plant after it blooms. They can multiply to overcome the space where they are planted and need to be pruned to control their spread. Mother plants die after blooming, becoming unsightly, so need to be pruned away from healthy pups. Pruning bromeliads can be tedious and -- in the case of large, spiny varieties -- somewhat dangerous if the proper protective equipment is not used. Mix 1 part bleach and 10 parts water to clean pruning and cutting tools. Dip or wipe the blades of cutting tools with this solution before and during use to keep from spreading disease. Don protective gloves and clothing if working with spiny-leaved varieties to prevent injuries. Leather gloves and thick clothing provide the best protection. Locate and remove declining mother plants with pups with at least three leaves. Cut as close to the stem as possible to prevent leftover rotting parts that can invite disease and insects. Prune unwanted plants from areas where they have encroached, cutting as close to the stem as possible. Remove entire plants if necessary to leave at least 1 foot of space for future spread. Discard pruned mother plants or add to a compost pile. These plants will not bloom again. Water plants well to replace the water in the plant cups. Let removed pups season for 48 hours before potting. Transplant larger removed plants with roots showing to pots or directly to other areas by planting in the ground and watering properly. 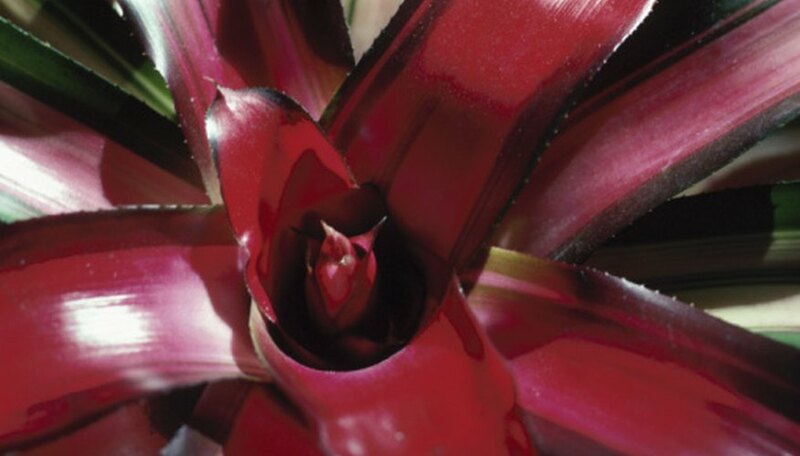 Clean any injury by bromeliad spines carefully with alcohol and use antihistamine cream to stop the itching. Apply antibiotic cream or ointment to prevent infection. Mary Francis is a horticulturist and expert garden writer with more than 15 years experience in the field. With degrees in both horticulture and business management, she has owned her own greenhouse business, an office organization business and now works full-time as a professional writer.